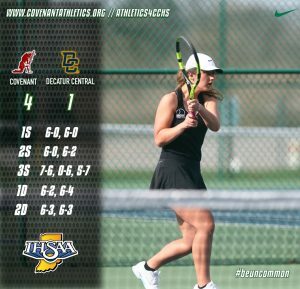 The Girls Tennis team got the 2019 season started with a win on Thursday night, as they defeated Decatur Central HS 4-1. Though the Lady Warriors were a bit shorthanded due to Spring Break, CCHS won at #1 Singles, #2 Singles, and both Doubles positions. Sophomore Hana Anderson swept DC Junior Alex Sumpter 6-0, 6-0 at #1 Singles, while Sophomore Becca Turner won at #2 Singles, 6-0, 6-2. Sophomore Phoebe Bacon took the lone loss on the night, in an extremely competitive match, 7-6, 6-0, 5-7. Seniors Leah Davidson and Shelby Yates won at #1 Doubles 6-2, 6-4, while Senior Grace Flasher and Sophomore Elaina Essig took the #2 Doubles position 6-3, 6-3. The Lady Warriors will be back at home for the first time on Saturday, as they host the Covenant Invitational, beginning at 9:00 am. The field of teams includes CCHS, Seton Catholic HS, Speedway HS, and Western Boone HS.